The Eastern Hemlock, massive and majestic, has played a unique role in structuring northeastern forest environments, from Nova Scotia to Wisconsin and through the Appalachian Mountains to North Carolina, Tennessee, and Alabama. A �foundation species� influencing all the species in the ecosystem surrounding it, this iconic North American tree has long inspired poets and artists as well as naturalists and scientists. Five thousand years ago, the hemlock collapsed as a result of abrupt global climate change. Now this iconic tree faces extinction once again because of an invasive insect, the hemlock woolly adelgid. 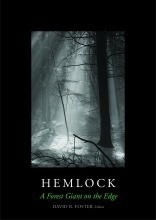 Drawing from a century of studies at Harvard University's Harvard Forest, one of the most well-regarded long-term ecological research programs in North America, the authors explore what hemlock's modern decline can tell us about the challenges facing nature and society in an era of habitat changes and fragmentation, as well as global change. David R. Foster, Audrey Barker Plotkin, Anthony D'Amato, Benjamin Baiser, Aaron M. Ellison, David Orwig, Wyatt Oswald, and Jonathan Thompson are scientific collaborators and colleagues at Harvard University's Harvard Forest.